There’s plenty of tutorials on how to make metallic text, but most of them involve complex multi-step procedures in Photoshop, which can be quite time-consuming. And certainly there are people who don’t have Photoshop or aren’t familiar with it. Fortunately, there are some online tools that can help you make metallic text – and make it much faster and easier than in Photoshop. 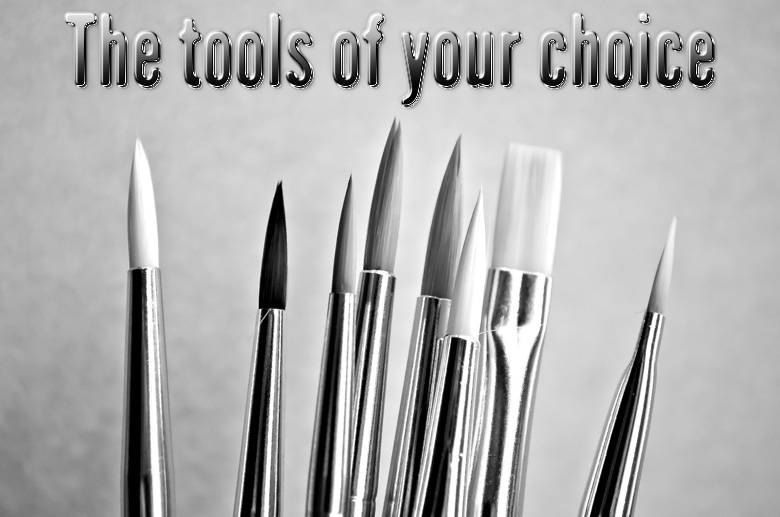 Recently I’ve tested three of these tools. 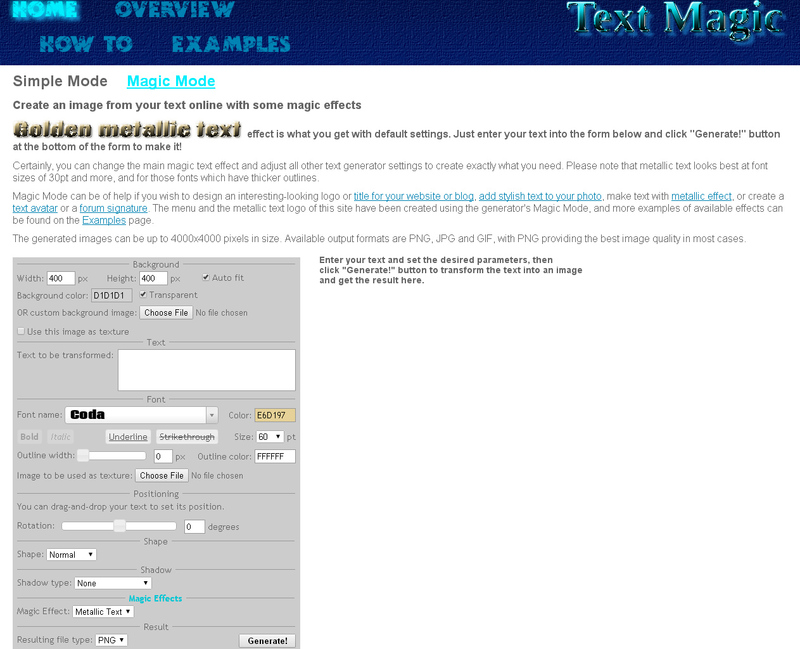 This site offers about twenty various text generators, and the one for metallic text resides here. The generator, however, has very few available options. Three slightly differing metallic textures, from two to six preset colors for each of them – and no font selector at all, so there’ll be only one font at your disposal. You can see it in the samples below. The site also has a gallery of ready-made images, maybe it contains something like metallic text, but you can’t change the text itself in this case. This tool is a multi-purpose text generator. All operations are done within a single form, so there’s no need to click through many pages. Additionally, it’s the only site of the three where I haven’t noticed any ads. Metallic text generation is switched on via an option on the form in the so-called Magic effects section. Here you have far more control over font, color and other settings than on TextSpace.net. Particularly, Text Magic offers about 30 various fonts, and the colors can be set freely via a color picker or direct input – both for text and background. Moreover, there are such options as curved or rotated text. Notice the shadow on the last one. Shadows can be also customized here: you can set the color and the position of the shadow independently of the text. This online service offers a huge set of various text generators, and they are absolutely grade A in terms of realism and quality of graphics. Metallic text generators are located here. I couldn’t provide a complete screenshot because the page is very long. There are definitely no less than two hundred metallic textures – probably even too many, as it gets difficult to choose the right one from this variety. After you’ve chosen the texture, you can set other options on the next page. The color of the text can’t be changed as it is obviously defined by the selected texture, but you have full control over the background color. And the selection of fonts here is as huge as the variety of textures. However, as regards font sizes, there are only two options, Normal and Big. Three samples made with PictureToPeople generator are shown below. Shadow options here are not as rich as at Text-Magic.com, but they are probably sufficient for most cases, except for those when you need a coloured shadow. Due to lack of options, I wouldn’t recommend TextSpace.net, except for the case when the font on the above sample images from this site suits your needs best. If you want high level of customization options for the text and the shadow, especially regarding colors, or you wish to create curved or rotated metallic text or place it onto an image from your computer, then Text-Magic.com is your best choice. 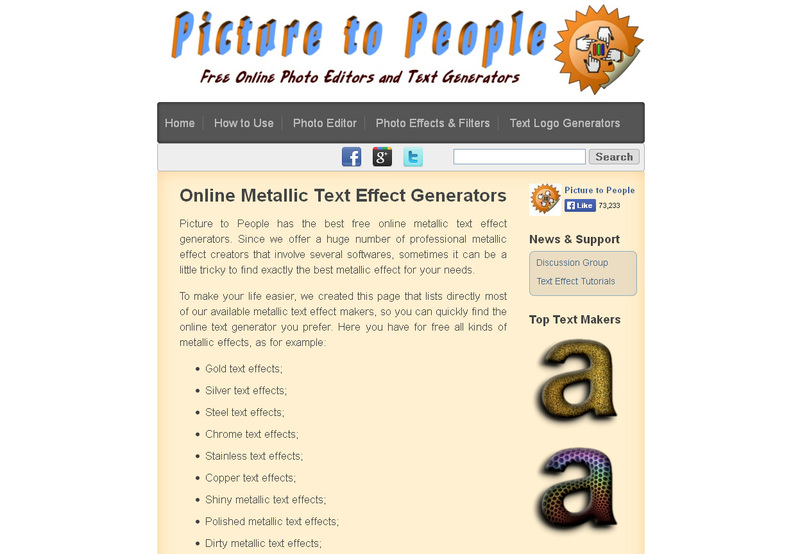 If you need highly realistic 3D metallic textures for your text and don’t mind scrolling over hundreds of available samples, you’d better check PictureToPeople.org, first of all.